After loading the two Father’s day free printable packs to the website I wanted to show you all one way you can use the tie printable available in the pack. You can use the tie to decorate a DIY Father’s Day card, perfect for making with your little ones. You can download just the tie printable or the entire pack, it’s up to you. Step 1. Fold an A4 piece of coloured card in half. Step 2. Cut 1 ½ inches in on either side, 1 ½ inches from the top through both parts of the card (with the fold on the left). Step 3. Open up the card and continue the cut right through the back section of the card. Step 4. You should now have a loose flap part at the back of the card (with the front still attached). Fold the back flap forward, overlapping the front. Step 6. Decorate! Add your favourite tie printable to the front (sticking down the collar pieces once you have the tie glued on). You can now stick buttons to the collar. If you would like to further decorate your card, you can add a pocket, with handkerchief and even sleeves; this will however require an extra piece of card as noted above. For a pocket, cut a small rectangle in a different colour using paper or card so it stands out from the shirt, trimming the bottom corners off. 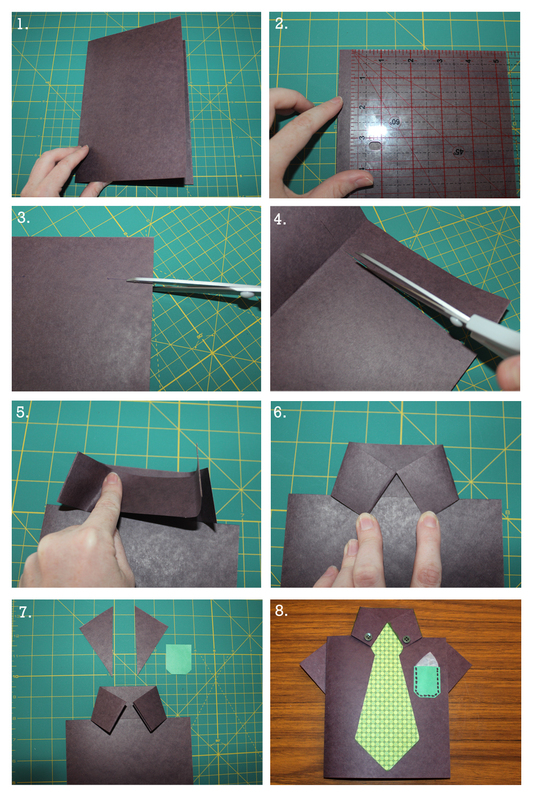 Use some tissue paper, or any material you like to make a hanky. For the sleeves, cut two triangles and attach them either side of your shirt card. Use your imagination and add any details you like. 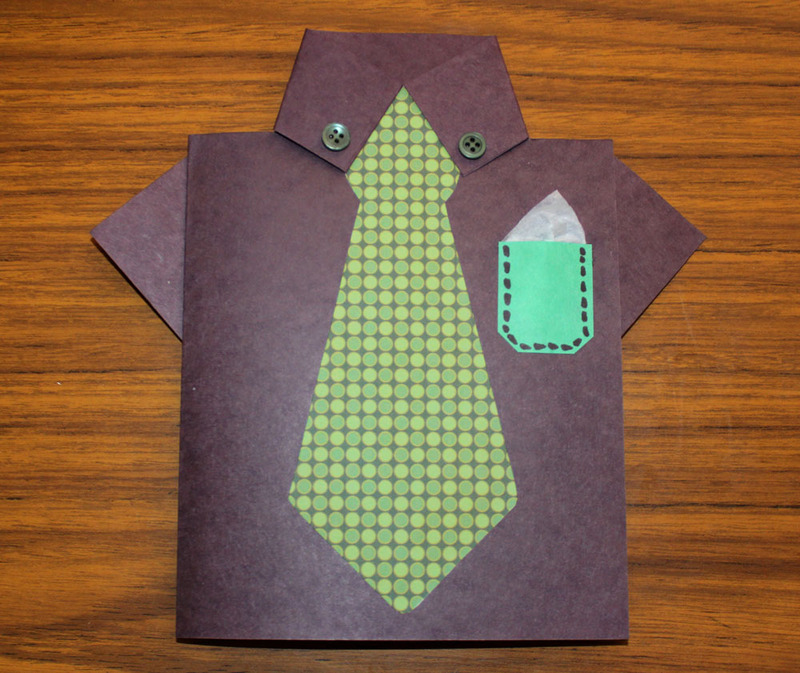 If you have used a dark colour card for your shirt you may need to cut a piece of paper out and glue it to the inside so you can write your Father’s Day message. Or you may like to design something on the computer and print it out. Personally I like hand written cards, especially when it is from little children. Their hand writing is something that will be treasured by Dad and makes the homemade card just that little be special. 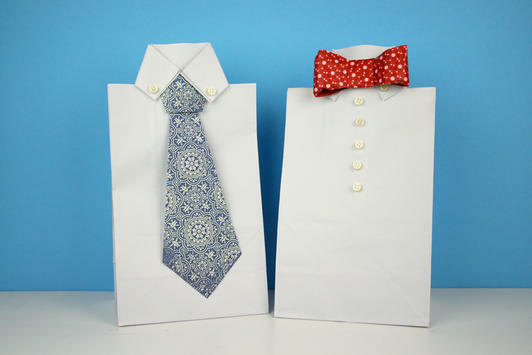 You can use the above directions (skip step 4) on a paper bag to make Dad a Goodie Bag for Father’s Day. It’s a simple way to give Dad all his favourite treats in a fun, custom bag. Pick out all of his fave chocolates, nuts, chips, lollies or any other treats Dad loves. That’s fantastic Petrina!! Happy to be of help. Make sure you take photos, I’d love to see Have a great day tomorrow, will miss you all!